These are poured ingots by a industry standard manufacturer. Most people who are interested in silver have seen 100 oz poured ingots. The two main manufacturers in my mind for these poured ingots are Johnson Matthey (J&M) and Englehard. These are good choices for someone who wants name brand silver bullion in 100 oz size with a small premium. You can generally acquire a 100 oz J&M or Englehard bar for approximately $1.50 to $1.75 over the New York Spot Price of Silver. While there are poured ingots in sizes smaller than 100 oz, I would buy only poured ingots in 100 oz; anything smaller I would buy in die struck. Many of the uncommon poured ingot sizes, like 20 oz, 50 oz, etc., have a premium that is unnecessary. We are specifically referring to die cast bars or ingots by major manufacturers. Die struck bars typically have a rectangular shape. The center portion of the bar, regardless of size, normally has the name of the producer, fineness and total weight in troy ounces in raised letters (hence the striking portion). The name brand manufacturers most frequently requested are Johnson Matthey, Englehard, Pamp Suisse and other manufacturers like APMEX, Sunshine Mining and U.S. Assay Mining Office. 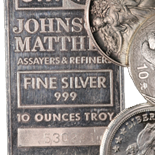 While the Johnson Matthey, Englehard and Pamp Suisse are the most popular, any die struck silver bar in 1 oz, 5 oz or 10 oz size is an in-demand item. Premiums generally go up as the size of the die cast bar goes down. If you are going to put together a mix of 1 oz, 5 oz and 10 oz bars, expect to pay more per ounce than if you are buying 100 oz bars. The premium for 1 to 10 oz die struck bars can range from $1.50 over spot to $3.50 over spot depending on market conditions and supply. There are many other global mint coins, some which carry a premium over the types above. For instance, some of the Lunar Series Maple Leaf silver coins from the Canadian Mint bring prices that are double or triple their silver value. Paying those higher premiums might make sense for someone looking to invest in a collector series, but the traditional bullion buyer normally wants to stick with items as close as possible to the spot price. There is a wide range on the premiums for these coins, on a percentage basis. For instance, the 1 oz Silver American Eagle sells for around $3.25 over the NY post price of silver. Chinese Silver Pandas can sell in the current market for as much as $10-$12 over the NY Spot price. Coins from the Austrian Mint (Philharmonics) and the Canadian Mint (Maple Leaf) sell for a range of $2.50 to $2.75 over the NY Spot Price. Again, it is up to the investor to decide what design they like and their motivation (collecting or traditional investing). Availability can be a factor. It is a bad thing to get too caught up on the premiums on these coins; all reputable coin dealers have to pay premiums to buy these coins so the downside on any individual bullion product is very low. The last category is 1 oz silver rounds. The 1 oz silver round is basically a coin that is struck by private refiners, and there are many of them. They are guaranteed to be a 1 oz .999 fine silver unit in coin form. If you are interested in buying silver only in coin form at the lowest premium possible, then silver rounds are the way to go. You can buy any design just as long as the premium stays between a range of $1.50 to $2.00 over the NY Spot Price. If the premium exceeds this range, start buying major products in one of the other major categories. We hope that this brief tutorial will help you traverse the diverse product range of silver bullion items. We don’t advocate avoiding higher premium items, nor do we believe that lower premium products are inferior. Personally, we like to keep 1 to 10 oz Johnson Matthey bars. We also like the 1 oz ingots produced by Pamp Suisse and Credit Suisse. Ultimately, your own goals and preferences as well as product availability and other market factors will determine which silver products are right for you. Contact Meridian Coin at (310) 375-4000 for assistance in building your own silver bullion collection.